The 'bianconeri' triumphed 3-0 in the field of Sassuolo with a goal and an assist from the exmadridista. Now, the advantage over Naples is 11 points. The 'minicrisis' of Juventus, lived last week with the elimination of the Italian Cup and the unexpected 3-3 with Parma, is over very soon. The Bianconeri, with a Christian in his best version, got rid of Sassuolo with a clear 0-3 and they moved away from Napoli, which now marches to 11 points of his first place. Sailing the eighth consecutive league title seems almost impossible. Without its BBC (Barzagli was on the bench, Bonucci and Chiellini will return to work with the group starting tomorrow), Allegri had to go back to start with Rugani and Cáceres in defense, while Dybala, after the 'scare' against Parma, started the match again from the bench. De Zerbi, very aggressive, had a huge opportunity to break the game after just three minutes: Djuricic anticipated Rugani himself and appeared only before Szczesny, who knocked him out in the middle of the area, although he touched the ball first. The referee consulted the images of the VAR and did not grant a penalty. A Consigli error, however, served to open the can: the local goalkeeper first handed the ball to Cristiano and then, misdirecting a whiplash from the Portuguese, handed him the ball to Khedira, who only had to push between clubs. The match remained even despite the goal, and in the beginning of the second half, Berardi squandered a huge gift from Szczesny, whose poor exit from the area opened the empty goal. The neroverde end, however, shot out. Minutes before, to Cristiano they annulled a goal to him out of game. The exmadridista had been ignited and, from there, he was the undisputed protagonist of the afternoon: a fan invaded the field only to embrace him, then the Portuguese struck in the face his friend Khedira with a shot (left him on the floor stunned) and, above all, scored with an imperious header the goal of 0-2, receiving a perfect corner of Pjanic. It was the target number 18 in 23 days of Serie A for a 'capocannoniere' each week more unstoppable. 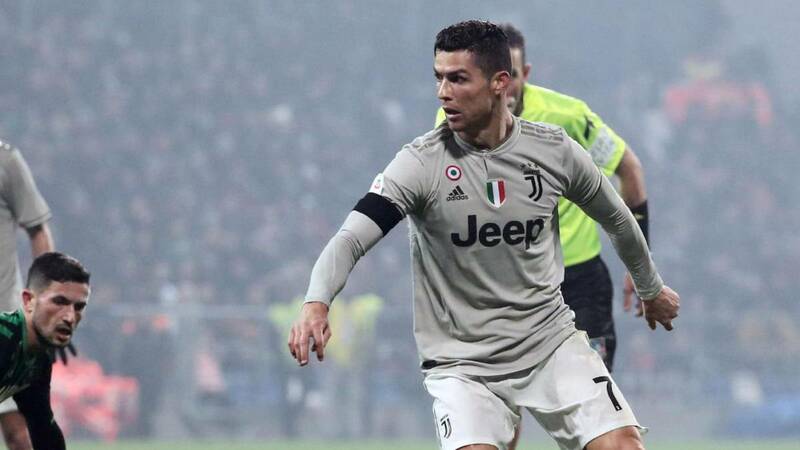 Ronaldo dedicated his celebration to Dybala (with the famous 'mask'), who lives a difficult time and disputed the last seven minutes of the confrontation. La Joya began the play of 0-3 looking for the Portuguese, who in turn yielded to Emre Can, whose crossed left-footed shot ended the job. A resounding victory for the Vecchia Signora, who approaches the Metropolitan Wanda with the Scudetto already in his pocket, his best returning men and an intractable Christian. The Colombian Duván Zapata pulled Atalanta on Sunday, when he scored a goal and an assist in the 2-1 victory against Spal de Ferrara in the 23rd round of the Italian Serie A, which allowed the Bergamo team to continue in the fight for a place in the next Champions League. At the Atleti Azzurri d'Italia stadium in Bergamo, Atalanta had an accessible a priori encounter, against the fourteenth of the table, although coach Giampiero Gasperini recalled in the press conference the day before (2-0) that his team suffered in the visit to Ferrara of the first round. Atalanta faced a Spal who jumped into the field with clear ideas and went ahead in the 8th minute with a header from "ex" Andrea Petagna, who had already punished Bergamo's team in Ferrara. The Spal defended itself in order against the local reaction, but his resistance was over in the 57th minute, when Duván offered the Slovenian Josip Ilicic a perfect low center and the half-tip pushed him to the net and reopened the match. The draw increased the momentum of an Atalanta who completed his comeback in the 80th minute, when Duván finished off an assist from the Dutchman Hans Hateboer to raise the final 2-1 to the scoreboard. It was celebrated with a serious face by the Colombian, determined to take the whole of Bergamo in the elite of European football. He has scored 16 goals in this league campaign for the Cali player, who is only one goal behind the Portuguese Cristiano Ronaldo, awaiting what the Portuguese star will do in the Sassuolo field. In the hands of Duván, Atalanta continues to dream and reached Rome and Lazio, with 38 points, momentarily in fourth position. Yes, Milan could overcome these three teams to win tonight at Cagliari. More bitter was on De Paul's Sunday, former player of Valencia, whose current team, Udinese, succumbed 1-0 in the field of Torino with a goal by English Ola Aina in the first half. The best occasion for the visitors came in the 75th minute, when the referee awarded a penalty with the help of the VAR. He threw it De Paul, but his shot was stopped by goalkeeper Salvatore Sirigu, who extended the scoring drought of the Argentine striker. After starting the year with four goals in five games, De Paul lives a very complicated moment and does not see the door since November 24, when he decided the victory against Roma. The hisrte does not accompany De Paul at this moment: the Argentine also had a great opportunity to score in added time, but his shot hit the crossbar after a double detour of the Turin defense. In the low zone of the table, the Bologna, that gave the surprise last week when winning to the Inter of Milan in San Siro, tied 1-1 in house against the Genoa and added a point that allows him to reach the Empoli in the seventeenth position. The team of Serbian coach Sinisa Mihajlovic is now out of the relegation zone, due to a better goal difference with Empoli. The Tuscan team played their league match on Thursday and lost it 1-0 in the Lazio field, rival of Sevilla in the last 32 of the Europa League, when they received a penalty goal by the Ecuadorian Felipe Caicedo. Frosinone regained enthusiasm, achieving a transcendent 1-0 at the Sampdoria field to get two points from the save zone.